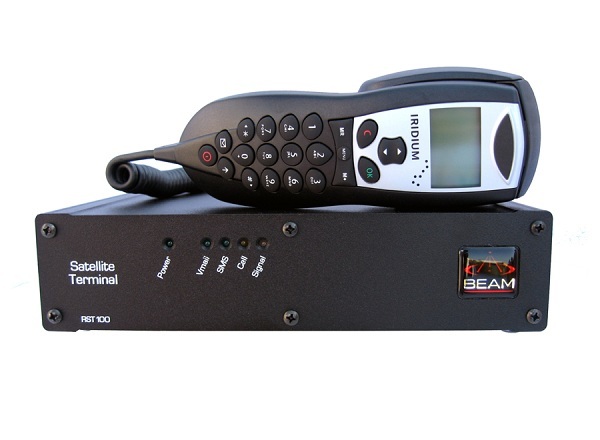 The BEAM RST100A Remote Satellite Terminal is a rack mountable Iridium phone system with an RJ-11 phone port. 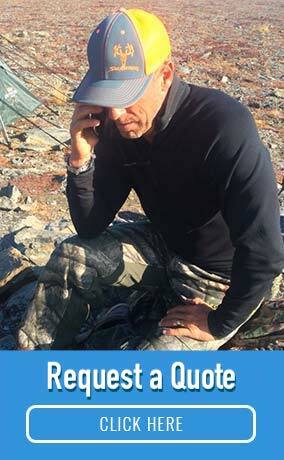 It can be integrated into a PBX so that calls can be made or received from any location in a ship or building. 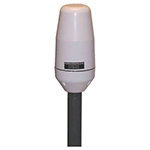 External mast antenna options are available with cable lengths up to 30 meters. Iridium provides global coverage for voice, 2400 bps data, and SMS messaging services. 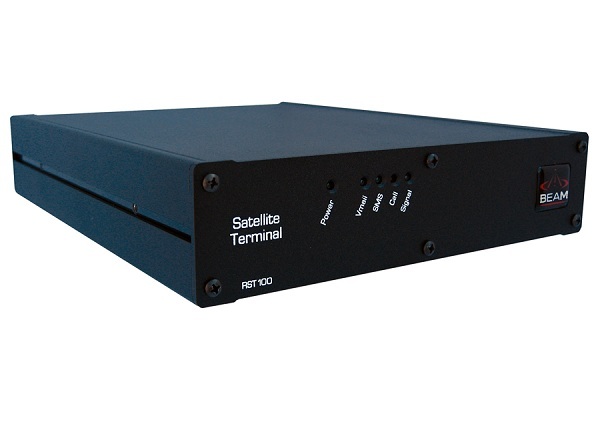 An LED display on the BEAM RST100 indicates the status of power, satellite signal strength, ongoing call status, and message waiting. 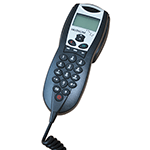 An optional BEAM RST970 Intelligent Handset is available. 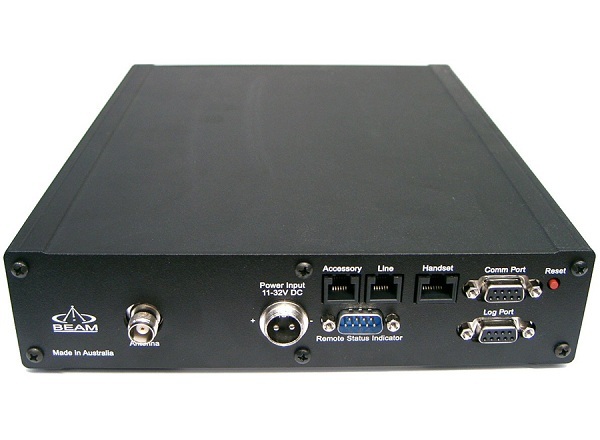 It uses a special RJ-45 port on the BEAM RST100A. An extension cable (1.5 meter) and a hang-up cup are included for easy wall mounting of the RST970 Intelligent Handset. The RST970 Intelligent Handset supports voice and SMS messaging services and has a built-in ringer with variable ring tones. Power: 11-32 VDC At 12 VDC, the unit draws 0.35 Amps in standby, 0.51 Amps whlle transmitting. 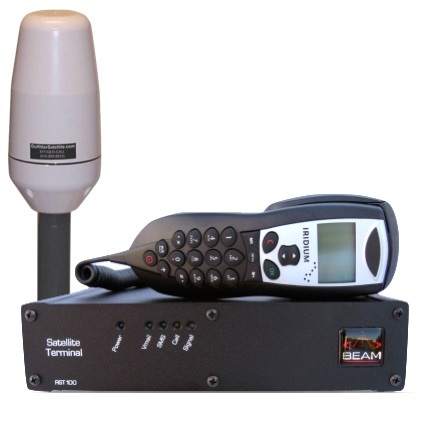 RST970 Intelligent Handset by BEAM provides a phone directly connected to the RST100A terminal with a built-in ring alert and SMS services. Mast Antenna with cable lengths options of 10, 20, and 30 meters. 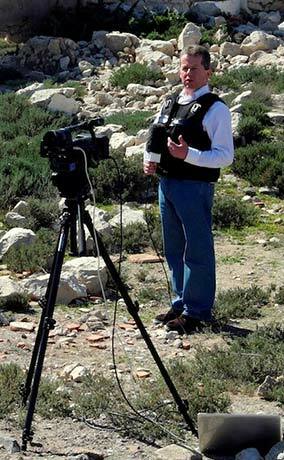 Fax Adapter supports use with conventional fax machines. 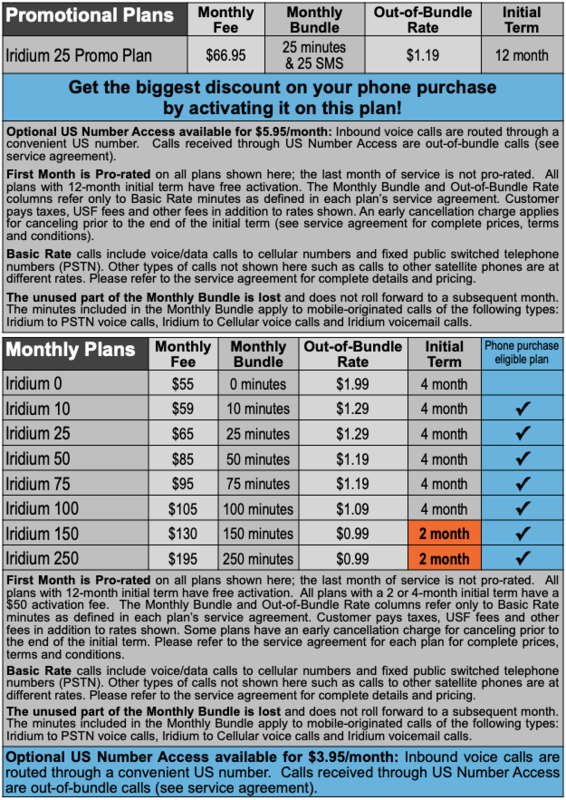 The Monthly Plans and Global Prepaid Plans presented above have global coverage except for a short list of countries that have opted-out of Iridium coverage. 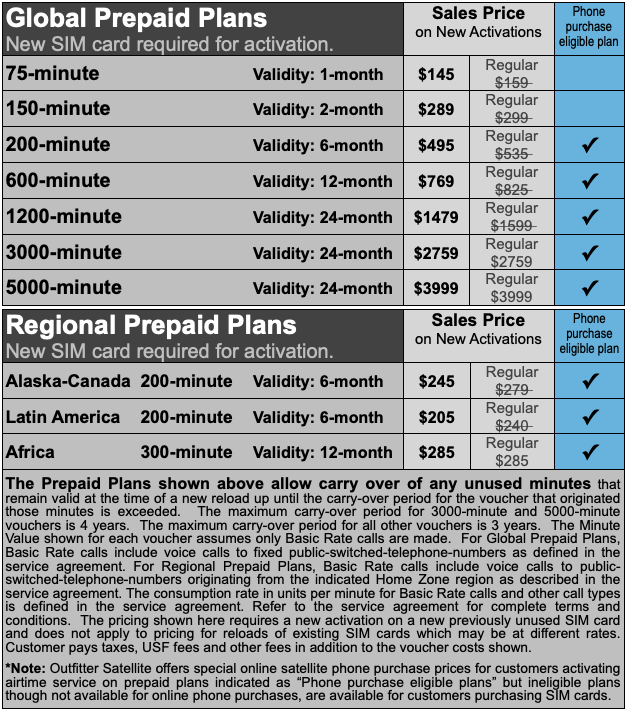 The Regional Prepaid Plans presented above provide service in a geographically-restricted Home Zone Region. There is a small percentage of instances where the geographic restriction will extend or retract from the Home Zone Region described here because the Iridium system interprets the call as originating from outside the designated Home Zone Region, and service availability is not guaranteed in these instances. Alaska-Canada Region (also called the Northern Lights region) covers the mainland of Alaska and Canada and 12-nautical miles into the associated coastal waters. Latin America Region covers Mexico, Central America, the entire South American continent and the coastal waters up to 12-nautical miles from coasts of these regions but explicitly excludes the Caribbean. Africa Prepaid Region covers the following areas or countries in Africa and 12-nautical miles into their associated coastal waters: Algeria, Angola, Benin, Botswana, Burkina Faso, Burundi, Cameroon, Cape Verde, Central African Republic, Chad, Democratic Republic of the Congo, Djibouti, Egypt, Equatorial Guinea, Eritrea, Ethiopia, Gabon, Gambia, Ghana, Guinea, Guinea- Bissau, Juan De Nova Island, Kenya, Lesotho, Madagascar, Malawi, Mali, Mauritania, Mauritius, Mayotte, Morocco, Mozambique, Namibia, Niger, Nigeria, Senegal, Sierra Leone, South Africa (inc. Price Edwards Island), United Republic of Tanzania, Tunisia, Uganda, Zambia, and Zimbabwe.